I have been fortunate to be called into primary for the last several years, (presidency & teaching) and I have LOVED it! There are several things that I have loved about working in primary, but one of the things that has been the BEST is being able to be in primary with my oldest son. I love being able to see first hand what he is learning. It is also great to be able to come home and talk about what we learned together. We moved into a new ward this past summer, so I was out of primary for a short while. During that time, I would ask my son how primary was and what he learned, and I’d get crickets. Or one word answers. I knew he was enjoying primary. I knew he was learning. But I couldn’t seem to get him to talk about it…unless he brought home a handout or coloring page that showed what his lesson was about. Then I could ask him SPECIFIC questions about what his lesson was about. For example, he would bring home a paper that he colored that said, “I am happy when I serve others.” From this, I could ask, “I see that you talked about serving others. What are some ways you can serve others?” And what do you know, he would open up and tell me all about what he learned about serving others, along with lots of other little details about primary. Shortly after moving into the new ward, I was called to teach the best 6 year-olds ever! When I began teaching, I wanted to be able to send home a handout or coloring page or something so that parents could use as a conversation starter with their children. But I found that not every lesson lend itself to handouts, and often times, the coloring pages would be left in primary. 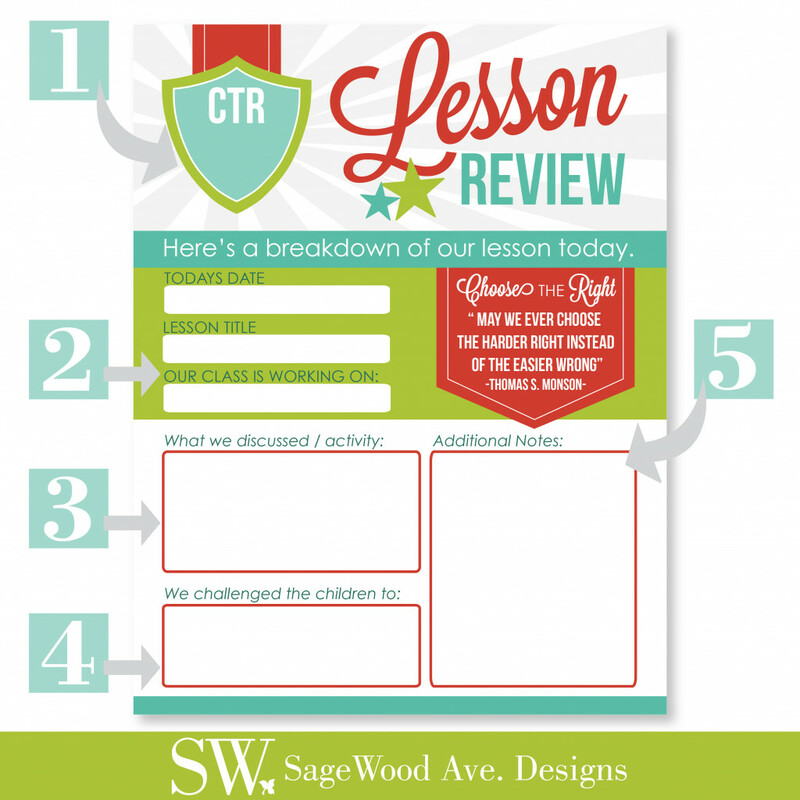 So I decided to create this printable LESSON REVIEW to email to parents each week after church. It has been a great resource for our class, so I thought I would share it with all of you! This worksheet can be filled out a few different ways. You can hand write the information in. But if that doesn’t sound so enticing, I have made these worksheets editable! If you have adobe reader, just open the files, click in the boxes to add text and type away! If that seems to intimidating, you can also upload the file to www.pdfescape.com and add text there. Then, save and email to the parents. Or, print and take to each home. If you had a child not attend that day, you could print and take to the home to let them know they were missed. 3- Use this area to summarize your lesson and share activities or games you played. 4- Use this area to share what you challenged the children to do during the week. 5- This area can be used to give parents some talking points to use with their children. Or if you want to make a sheet for each child, you could write something that the child said or did during class. As a parent, I love hearing what my kid talks about when I’m not around:) You could also use this area to share a simple testimony. I have created 3 different sheets. 1 for CTR classes, 1 for Valiant classes, and 1 for Sharing Time. 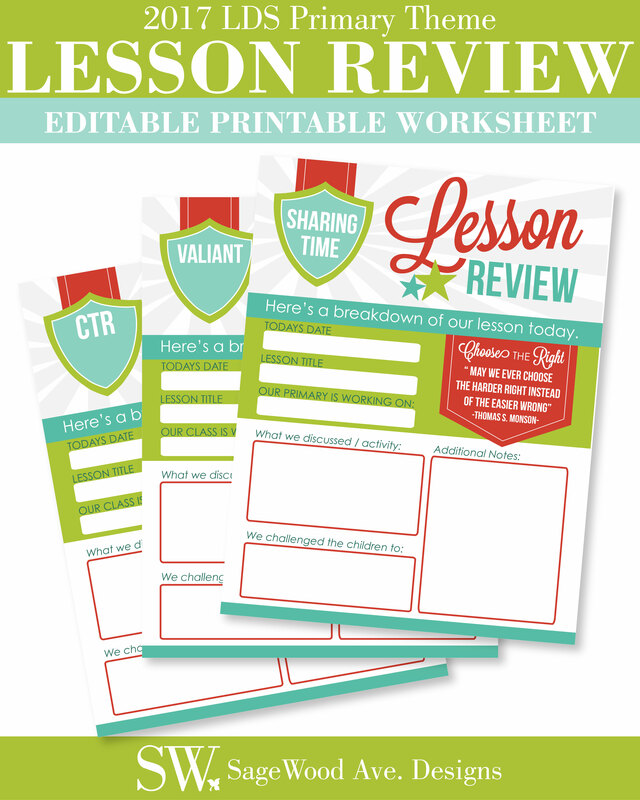 I hope you find these Lesson Review Worksheets helpful for you in your classes. I designed these worksheets to coordinate with my 2017 LDS Primary Theme Printables that are available in my shop. 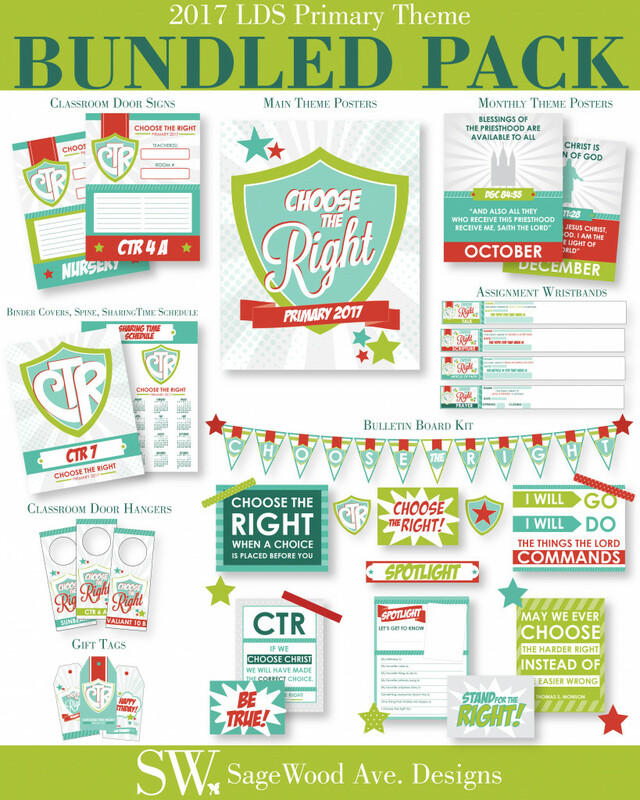 Click here for more information on these coordinating printables. This entry was posted in Primary on November 22, 2016 by Melanie Biddulph.